When I tell people outside of the world of basketball of my experience in “basketball analytics” they often have no idea what that means. I used to explain that it’s like “Moneyball” but for basketball. I’m increasingly hesitant to use this analogy though, because I’ve realized “Moneyball” presents a false dichotomy. You may remember the scene where Billy Beane (played by Brad Pitt) and a room full of old school scouts discuss which players to target in free agency. The scouts are going on about a player’s stance, how confident he looks, and how repeatable his swing looks. Billy shuts them all down, complaining that their words are basically nonsense. Billy makes it clear that the right way to find undervalued players is through statistics, not through traditional scouting. While Billy is certainly onto something, he is also making an oversimplification. The best sports organizations combine old school scouting (the “eye test”) with statistical analysis. Both are tools that help a decision maker improve their team – whether it’s an NBA General Manager making valuations in free agency, or a high school basketball coach determining what kind of defense to play. In this article, I hope to demystify some basketball analytics like Offensive Rating and Defensive Rating, showing how a more thorough look at statistics leads to better insights. The most fundamental concept of “basketball analytics” is that basketball is a possession based game. If we look at numbers on a per possession basis, we can make more accurate conclusions (The NBA stats database is great for this). For example, a quick glance at some basic statistics show that the Utah Jazz did not score a lot of points during the 2016-17 NBA season. The Jazz were 28th in the league at 100.7 points per game. But, looking deeper shows that the Jazz actually had an above-average offense. In fact, the Jazz were 12th in the league in offensive efficiency. The discrepancy is due to the Jazz’s slow pace of play. Utah had the slowest pace in the NBA at 93.6 possessions per game, giving the team fewer opportunities to score. The Jazz slowly brought the ball up the floor, ran complicated plays, and usually shot late into the shot clock. But Utah’s offense was efficient with its limited possessions, as it scored 107.4 points per 100 possessions. Points scored per 100 possessions is called Offensive Rating. It is useful to look at stats on a “per 100 possessions” basis because it adjusts for each team’s differing pace. The same principle applies to defense as well. In 2016-17, the Warriors allowed 106.4 points per game, 12th highest in the league. Looks like they had a pretty average defense, right? In reality, the Warriors had the fifth best defense in the league, with a Defensive Rating of 101.1 points allowed per 100 possessions. Golden State played at a fast pace, so its points allowed is higher than you’d expect from an elite defensive team. Because the Warriors had a lot of possessions per game, their opponents had more possessions as well, and more possessions means more opportunities to score. But, volume does not equal efficiency. A high volume of possessions doesn’t describe how effective a team is. Instead of looking at the raw numbers of points scored or allowed, we should look one step further at how efficient a team is at scoring or defending. A lot of what is described as “advanced analytics” are not really that advanced. Often, it’s just looking at a number in a slightly different and more useful way. While there are certainly some analytics that deserve the “advanced” adjective, they are often of limited use. To all coaches who feel overwhelmed and confused by all the new statistics, please do not worry – most are intuitive and take little effort to start using in practice. There is still, and will always be, a place for the classic “eye test.” There is real value in the years of experience coaches have closely watching basketball. There are many things that influence winning that cannot be represented by numbers. The best decisions are made when combining human intuition and experience with data. 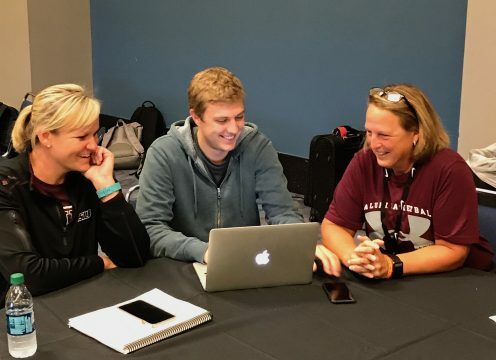 Stats “nerds” should be open to the wealth of knowledge that coaches can provide, and coaches should be open to new and more useful ways of looking at many stats. Don’t shortchange yourself by leaving a tool in the toolbox! Peter Stowell shows the FastStats program to the Southern Illinois women’s basketball coaching staff. Here’s a piece of advice to coaches just diving into analytics: If your eyes and the data agree on something, it is likely true. If your eyes and the data disagree, don’t blindly trust either. Attempt to analyze why the numbers do not match up with what you have seen. 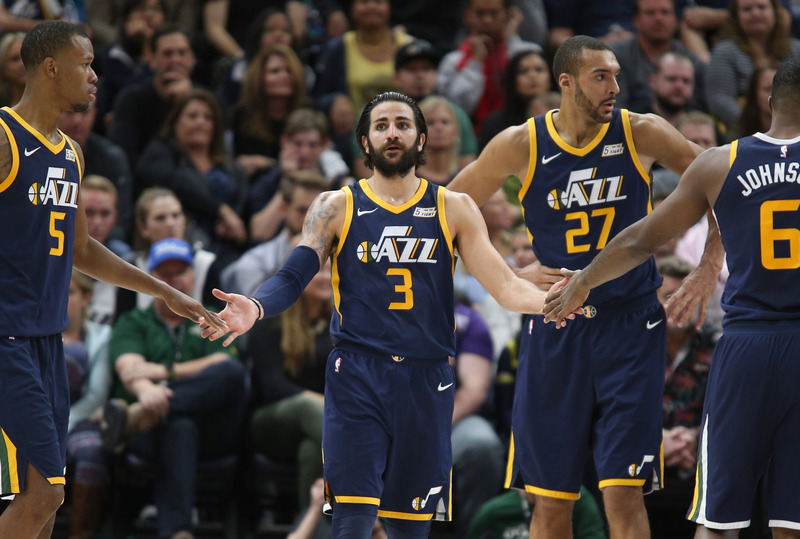 If you watched the Jazz in 2016-17, your eyes would have noticed they were a solid offensive team, but the data initially seemed to say otherwise. Looking at the data in a different and deeper way showed that your eyes and the data agreed. This is not always the case, and there is much room for improvement in data collection and analysis, but our friend Billy Beane was correct that focusing solely on the observation via the eye test is not enough. Peter studied Psychology and Statistics at BYU while running the analytics program for BYU Women's Basketball. He also worked in a research group at BYU building a predictive injury model for the Utah Jazz. He currently works in Basketball Analytics & Client Experience at FastModel Sports and is completing a Masters in Predictive Analytics from Northwestern University. Why don’t they make the FastStats app anymore?